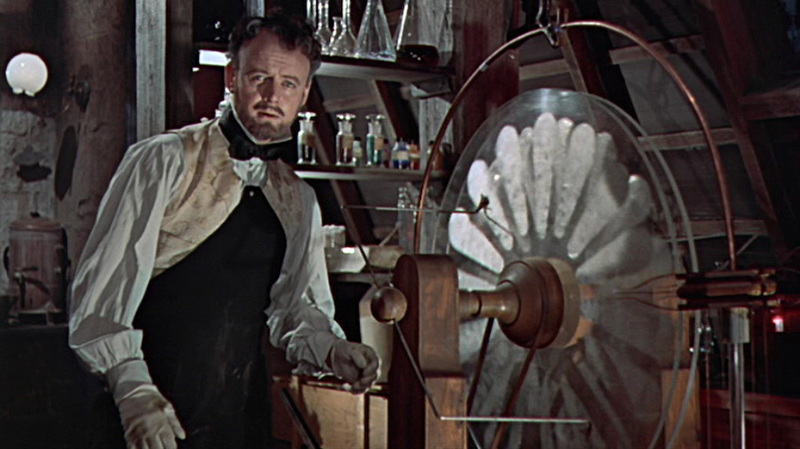 Cinema Sunday: The Curse of Frankenstein (1957) | Magazines and Monsters! ← The Defenders (1972) -The Hannigan/Trimpe/Perlin Run! To say that this film was groundbreaking for its time, is an overwhelming understatement. What Hammer Studios did was take the foundation of horror that was laid by Universal Pictures back in the 1930’s, and build a mansion of horror on top. 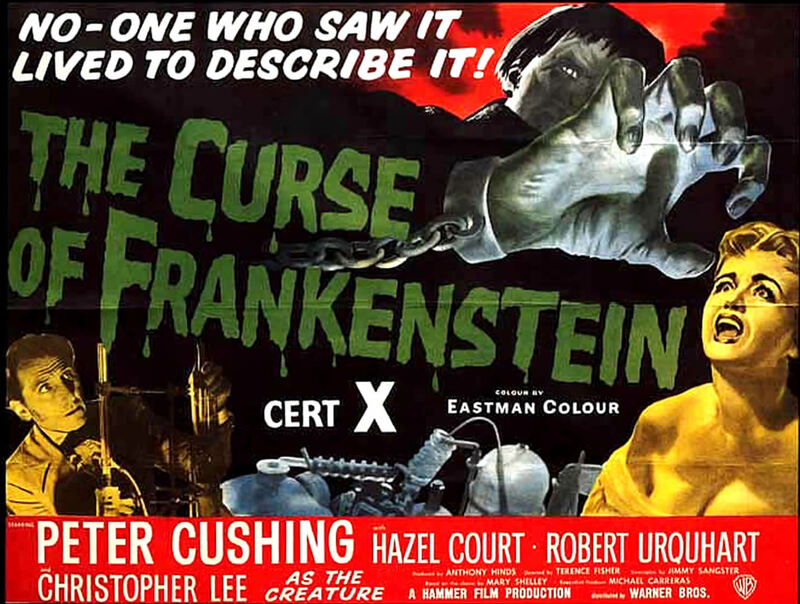 It all began with this film, The Curse of Frankenstein, in 1957. The film broke down barriers that had been in place for a long time, and nothing would be the same after its release. 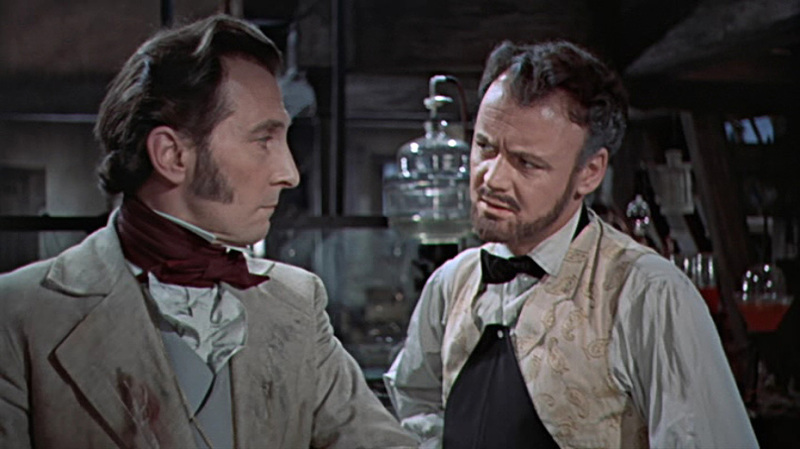 Peter Cushing is an absolute superstar in this one, and it vaulted his career into the atmosphere. Let us now turn back the clock to 1957, and witness the birth of true horror. The movie begins with a priest, as he rides along a windy path to a prison on a hill. Once there, he’s shown to a cell where a man is “raving”, but the priest enters alone anyway. 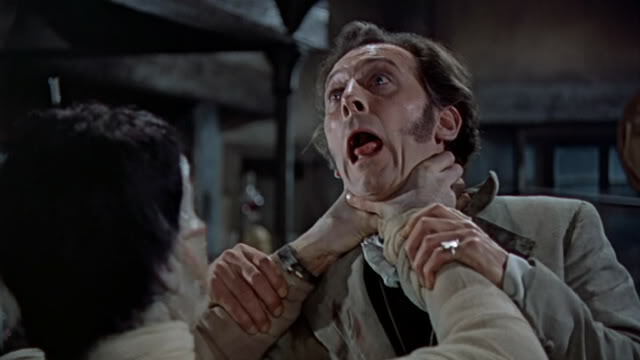 Baron Frankenstein (Peter Cushing) is the man inside the cell, and he’s scheduled to be hanged in one hour. He tells the priest to sit down and listen to his story, so that he can pass it on to others over time. The priest tells him to start at the beginning, so Baron Frankenstein begins his story in his childhood days, when his mother died. He explains to the priest that he inherited the family fortune at the age of fifteen, and brought in a tutor, Paul Krempe (Robert Urquhart- pic below), to finish his schooling. The two grow to be quite close, and after two years, the young Baron has learned all Paul can teach him. The two are fascinated by the possibility of regenerating dead matter, and go ahead with their plans to conduct experiments that will lead to such a result. After months of gathering information and equipment, they finally attempt to revive a dead puppy. The laboratory is filled with all sorts of arcane looking devices, and before you know it, they activate the machines, and revive the animal from the other side. At this point they theorize on what to do next. Paul believes they should share their findings with the medical federation that meets in London every year. The Baron disagrees, and tells Paul that now is the time to open Pandora’s Box, and “find what lies beyond it.” Paul seems confused, and the Baron tells him that they must build a man, piece by piece, and animate it, creating life, in the vein of God creating mankind itself. Paul seems skeptical, but agrees to go forward. A neighboring town has just hanged a man for being a criminal, and hung his body at the town limits to warn others of the punishment waiting if they should try anything. Paul and the Baron cut the body down, and begin their experiment. First, the Baron tells Paul they must cut off the head, because the eyes and half of the head were eaten away by crows. Paul stands in shock and awe, as the Baron flippantly cuts off the head of the corpse. He then tosses it in a vat of acid, disposing of it once and for all. The Baron then informs Paul that he’s going away for a few days to get something (a new pair of hands for the creature). The next day, Paul is talking with Justine (Valerie Gaunt), the maid. 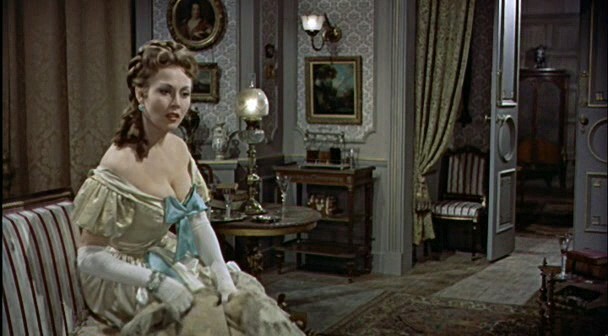 A knock at the door interrupts them, and the door opens to show Elizabeth (Hazel Court- pic below), the baron’s cousin. She announces that she’s coming to live there, and to be married to the Baron as it was arranged by her mother. Paul then tells the Baron (in seclusion) that he’s decided to stop helping him with the experiment. The Baron tells him to leave him alone, and continue on without any help. We next see the Baron and Justine, sharing a passionate kiss in a dark hallway. She tells him that she’s jealous of Elizabeth, and that she wants the Baron to marry her, as he promised. He kind of chuckles at her request, and then carries on with the make out session. The following day, the Baron leaves once again for more “materials”, and this time he brings back a new set of eyeballs for the creature. He then is seen examining them, close up. A knock on his laboratory door by Paul interrupts him, and then the two have a conversation about what the Baron is doing. The Baron then reveals the creature to Paul, but he rebuffs him again, and leaves. Another day or so passes, and we see that the Baron is hosting one of the most brilliant minds in Europe. This older gentleman is a scientist that is possibly more brilliant than the Baron himself. As they have conversation, Paul enters the room, and the Baron introduces the two. The Professor then tells them that he’s tired, and needs to retire for the evening. The Baron agrees to walk him to his room, and shows him a painting at the top of the balcony. We see the Baron get a strange look on his face, and then tell the Professor that if he backs up against the railing, he’ll get a better view. As he backs up, the Baron pushes him over the railing, shouting as if the Baron is having an accident. We get the impression that the Baron planned this all along. He then offers to let the body of the Professor rest in his families crypt, being that he had no family. After the burial, the Baron sneaks into the crypt, and removes the Professor’s brain. Paul shows up, and the two argue over the fact that the Baron basically murdered the Professor. The argument gets very heated, and then Paul grabs the bag containing the brain. A brief struggle ensues, and the brain gets smashed against the wall. The Baron get furious, and pushes Paul out of the way. Paul the warns Elizabeth that Victor is meddling with things he cannot control. She tells him that she wont be leaving, and he leaves her room, very disappointed. Next, we watch as Victor fixes the damage done to the brain by the struggle with Paul (or so he thinks). He then begins the process of reviving the creature. Initially, nothing seems to happen, but as he leaves the room, he then asks Paul to help him, and threatens to involve Elizabeth is he wont help him. Suddenly, he hears a loud crashing noise coming from the lab. He returns to see the creature (Christopher Lee), alive, and extremely volatile. It attacks the Baron, nearly killing him, if not for Paul intervening. The Baron is in ‘full arousal’ over this (even though he’s almost killed), and Paul is mystified at this reaction. Paul then begs Victor to dispose of the creature, but Victor tells Paul it’s his fault because he damaged the brain in the fight they had previously. The following day, the creature gets loose, goes into the forest, and kills an old man and his grandson. Victor asks Paul for his help in tracking it down, then, Paul brings a rifle, and shoots the creature, killing it once and for all…or so he thinks. He and Victor bury the monster, but Victor then digs it up and keeps it secretly in his dungeon. Justine then threatens the Baron if he doesn’t marry her as he promised. He tells her that she had better not or face the consequences. He also tells her that she’d better be gone by tomorrow, or else. That night, Justine creeps out of her room to gather proof of what’s going on in the laboratory, so she can either extort Victor or hurt him by telling the police. Victor realizes this, and lays a trap for her. As she creeps into the lab, and then the dungeon, Victor slyly locks the door behind her, and the creature kills her. Once again, Paul confronts Victor after learning the creature still lives. Victor and Paul argue and fight in the lab, then out in the street as well. The creature busts out of his chains, and attacks Elizabeth on the rooftop. Victor grabs a pistol, and in trying to shoot the creature, accidentally shoots Elizabeth. The creature then attacks him, but he throws a lantern at it, and it is engulfed in fire. It then stumbles towards the window, and falls into the pit of acid. We then return to the prison, as Baron Frankenstein finishes his story, and the priest seems unconvinced. The guard then tells the Baron that Paul Krempe has come for a visit, and he shows him in. Victor begs Paul to corroborate his story, but Paul acts as if he has no clue what the Baron is talking about. The priest walks out, and Victor then attacks Paul, but the guards drag him off. Paul leaves and tells Elizabeth that Victor has gone insane. The last thing we see, is Baron Frankenstein being led to the gallows. In the beginning I said this film was groundbreaking, and that’s no exaggeration. It showed copious amounts of red blood, and now for the first time in color, it seemed even more revolting. Hammer is known for its “RED” blood, no doubt about that. The scenes of other grotesqueness include the Baron holding an eyeball right in front of the audience, the reveal of the creatures horrific face, when the Baron cut off the head, and disposed of it in the acid, and so on. This movie pushed the envelope of what it meant to be a “horror” movie like no other of its time. Peter Cushing was marvelous, of course, and Robert Urquhart added a fantastic element of struggle against the Baron. Both men played off of each other very well, and showed how just two characters can carry an entire film literally by themselves. Yes, you did get Lee as the creature, and Hazel Court was beautiful, and well spoken, but those two men were the shining light of this movie, make no mistake. In typical Hammer fashion, we had sets that were awe-inspiring, and the locations were numerous but none more famous than Bray Studios. Fisher, Hinds, and Sangster, gave us a masterpiece with this film, and should be lauded for their efforts. Also in keeping with Hammer traditions, the music score by James Bernard will send chills up your spine and have you on the edge of your seat with his thunderous climaxes. If you’ve never seen this film, shame on you, and rectify this blemish on your record immediately. If you have watched this film but do not own it, buy this film in a set like I did (TCM Classic Horror), it includes four Hammer classics that every horror fan needs to own! I just saw this for the first time because your other reviews, really enjoyed Pauls character too rather than an “Igor” which is what I was expecting. Great Review! 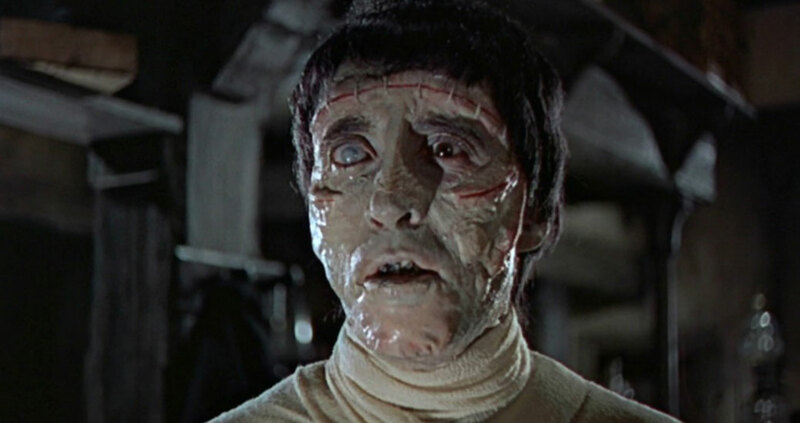 Pingback: Cinema Sunday: The Evil of Frankenstein (1964) | Magazines and Monsters! Pingback: Cinema Sunday: The Abominable Snowman (of the Himalayas) (1957) | Magazines and Monsters! Pingback: Cinema Sunday: The Flesh and the Fiends (1960) | Magazines and Monsters!